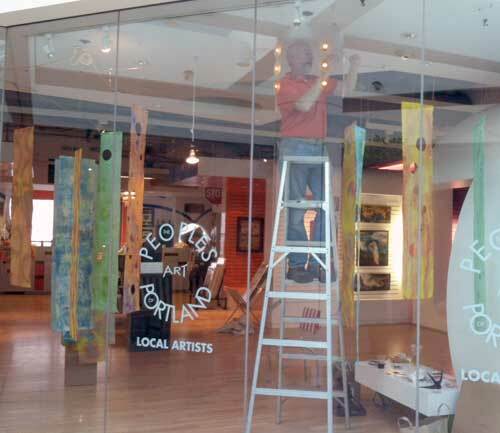 When Fred Swan and I had our show together People’s Art gallery a couple of years ago we looked at those big beautiful windows with the light streaming in and knew something special was going to happen there. 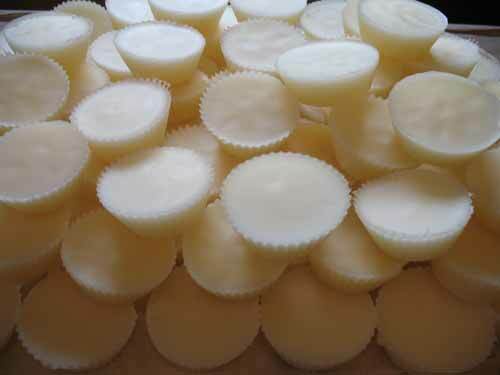 After some discussion about what would best fill that space we were intrigued by the idea of wax scrolls. 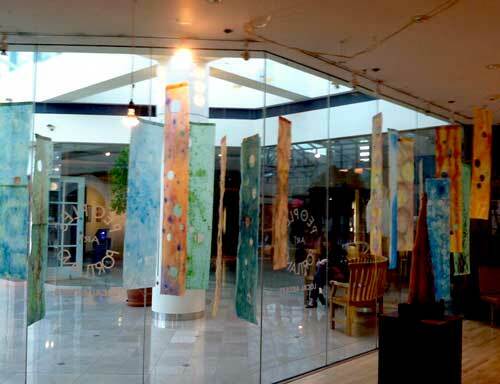 We worked independently on them, then brought our creations together as an installation in that front window. Having so many panels of paper and wax with that delicate natural light penetrating them filled the space with energy and movement. It was beautiful! 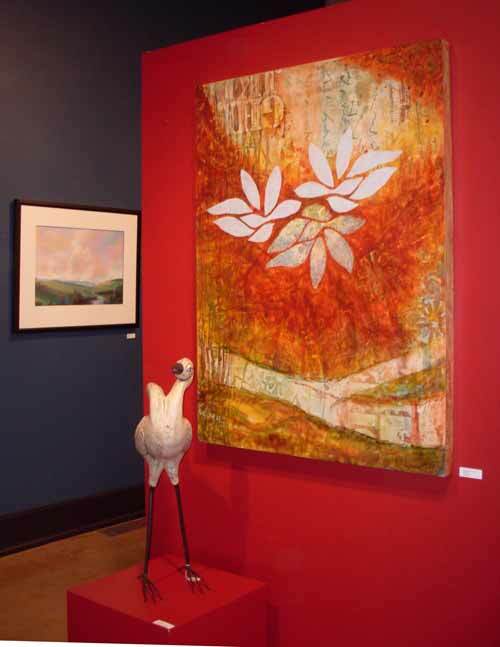 People were very excited about the feel and scent of these art works, as well as their visual appeal. This is the view of our installation from inside the gallery. 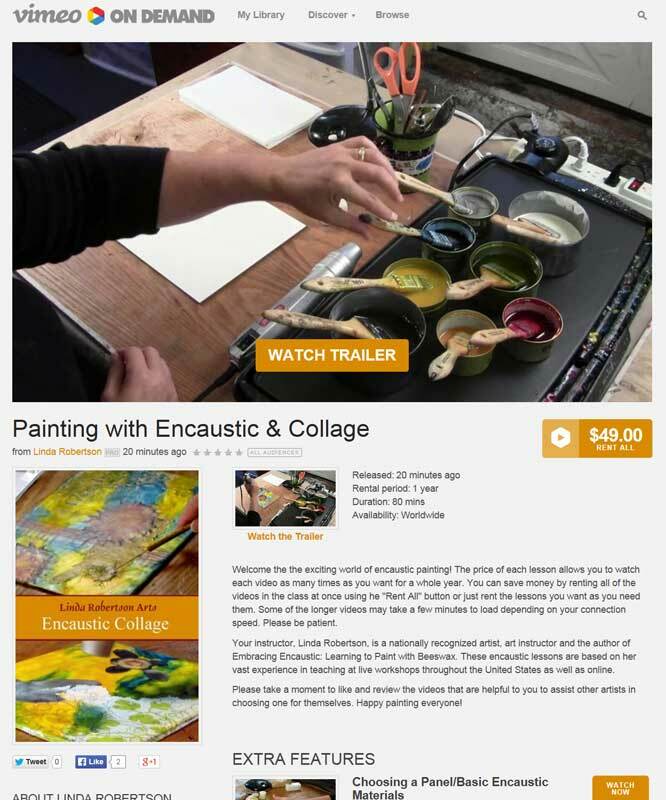 BTW, if you are brand new to encaustic you might want to start with my free video overview about encaustic materials (scroll down to “Extra Features”). I like to practice what I preach in my classes that no board is unsalvageable, especially in encaustic, but this one was NOT looking good. It had colors that didn’t go together and was the product of a demo I did for a very large crowd in Santa Fe last year so it’s safe to say that it was far more spontaneous than planned. The beauty of salvaging something is that you have those beautiful colors that come through the background and tend to be wonderful surprises. 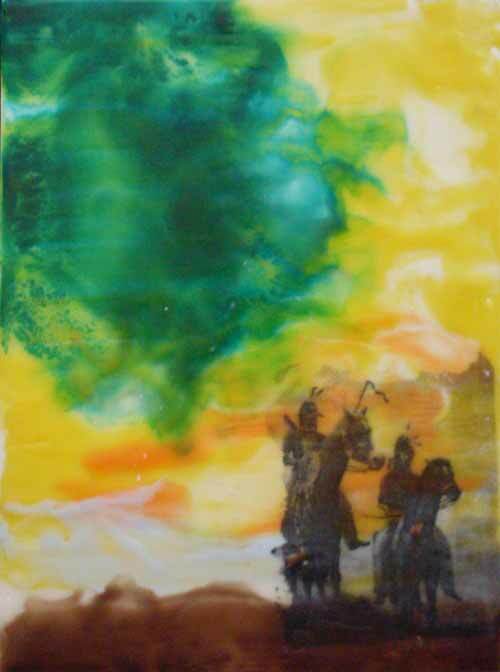 Many artists who work with wax and stencils together try to get very precise imagery but that’s not always the goal. I decided to do something very loose on this one. 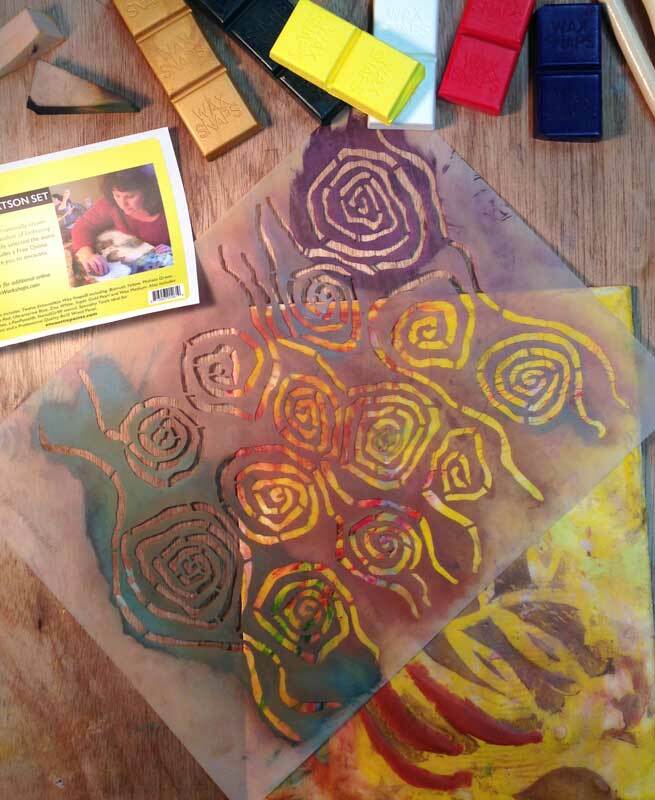 This stencil, called Eddy Rose, is from StencilGirl, and was designed by Mary Beth Shaw. To get this effect I painted the wax through the stencil as usual, but instead of fusing the stencil in place I pulled it up first and then fused it to let the pattern flow with the wax. The result was beautiful! You can really see the difference in the center photo above, where the top part of the board is fused and the bottom portion is not. I repeated this a couple of times alternating between Zinc White and Super Gold Pearl paint from Enkaustikos which are both included in my set. 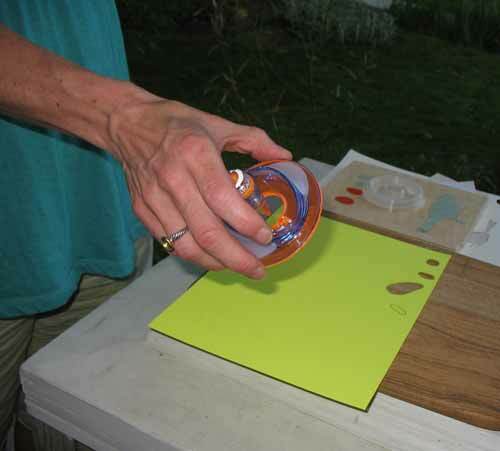 On June 19 from 6 – 9 pm I’m hosting guest instructor and color expert Kimberly Kent in my Portland, Oregon studio to help you expand your painting palette while you develop your color sensibility. Learn to mix, glaze and see color better. The exercises and techniques in this class will give you new tools for understanding how to mix just the color you need. 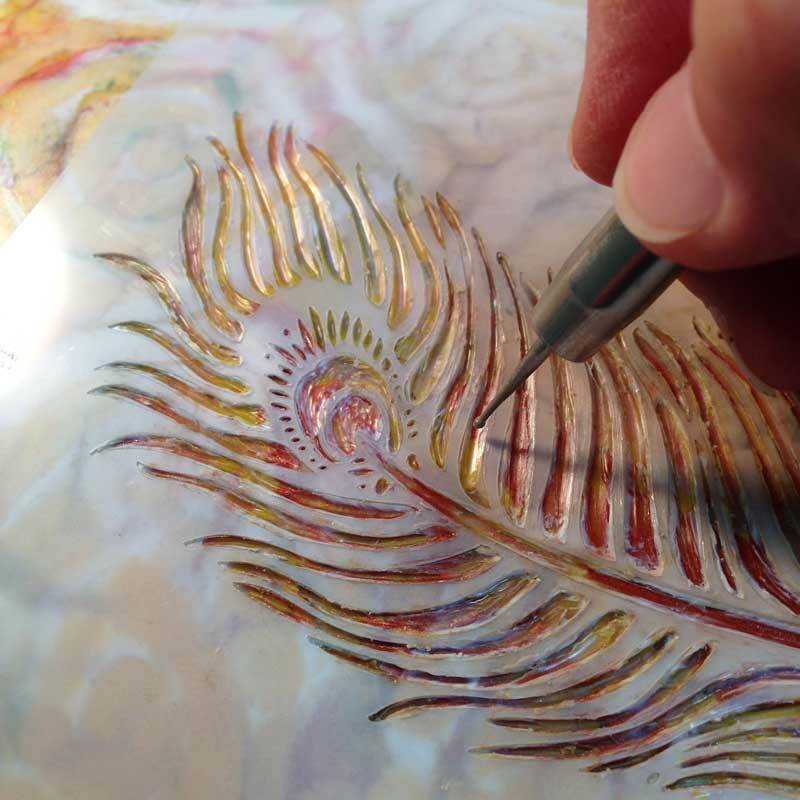 You’ll work in encaustic paint in this class, but these concepts can be applied to color mixing in any medium. 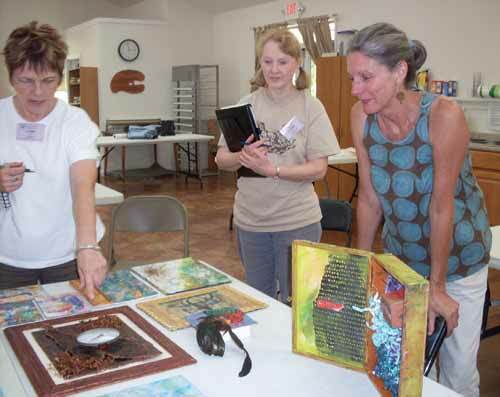 Find out more about my classes or register here. Here’s a great example of the tips you’ll learn in this class: To avoid making mud, mix two primaries first. Once you get as close as you can to your desired color add the third primary. For example, mix yellow and blue to make green, then a touch of red to get the green you want. Just a few tips like this will have you mixing colors like a pro! 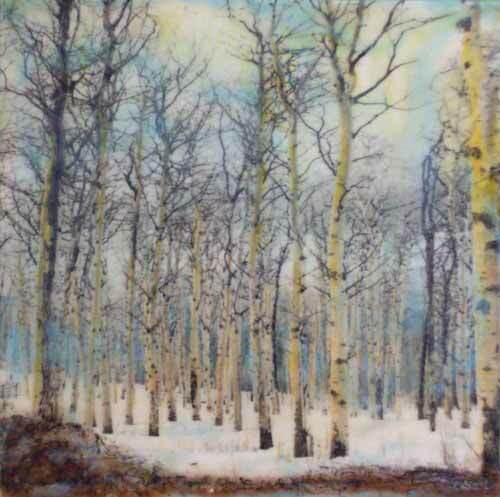 Linda Womack offers encaustic workshops in her Portland, Oregon studio as well as online encaustic classes at RobertsonWorkshops.com. Is Your Art Influenced by Music? I love a good art blog and Nancy Natale has got one. 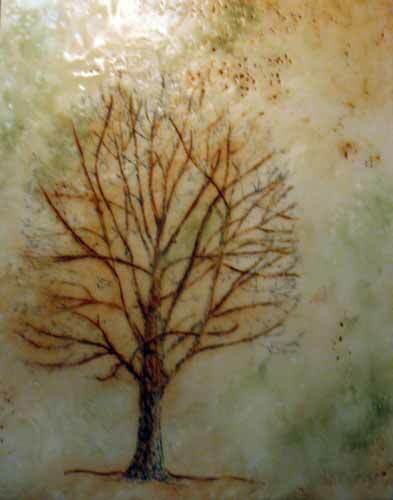 Nancy is a visual artist who works in several types of media including encaustic. We only see each other once a year or so at the International Encaustic Conference in Provincetown, but we keep up with each other through email, blogs and FaceBook. 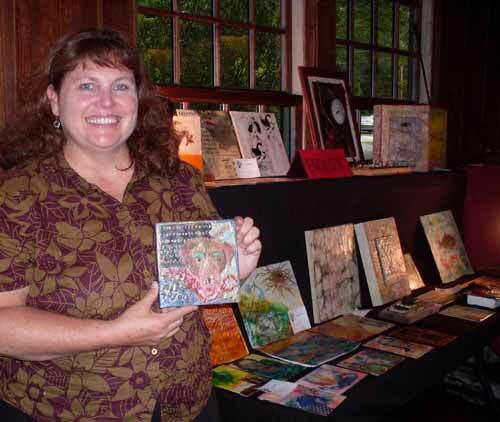 Last year she even bought one of my paintings at the conference. Recently Nancy put out a call for an online exhibit called Art & Music, looking for art influenced by music and I’m happy to have my work included in the show. While choosing which piece to submit I started looking at my art in a new light which I think is a good indication of a strong curatorial theme. The show turned into a fascinating look at several artists work I hadn’t seen before, as well as a new view of my own work. I hope you’ll view the show and then take a look at your work in a new light. Does music influence your art? Those of you who read my blog on a regular basis know all about my previous visits to the John Campbell Folk School, so I won’t revisit the basics again. 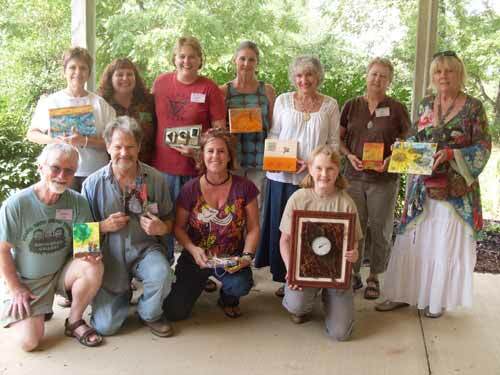 Instead I’ll focus on this amazing group of students brought together by my workshop there a few weeks ago. Wow, did we have fun! I’ve got several photos here for you to get an idea of how the workshop unfolded, and what wonderful friendships were forged. Dru and Louise had very different styles of working, but had a great time working together. Louise arrived in her big truck with just about everything under the sun so when we were missing something everyone asked, “Does Louise have it?” and she usually did. Thank goodness! 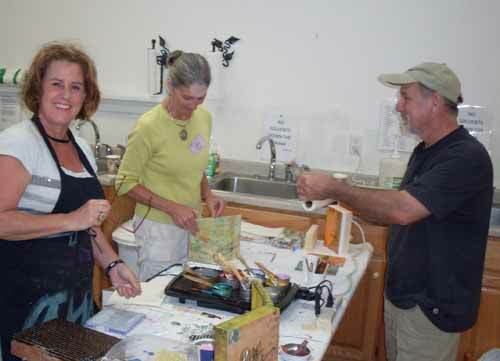 Anne and Susan taught wood turning instructor Jim about the basics of encaustic. Jim, along with several other instructors and students from other classes, stopped by to see what all the fuss was about and left with a copy of my book Embracing Encaustic in tow to get started at home. Here is the whole class on the last day along with some of their favorite work. The photo was taken by our wonderful studio assistant Susi Hall who managed to avoid my camera! Stacey made this wonderful piece with pins running through balls of wax that were scraped off of other paintings. It's a wonderful reminder that everything doesn't need to be flat! 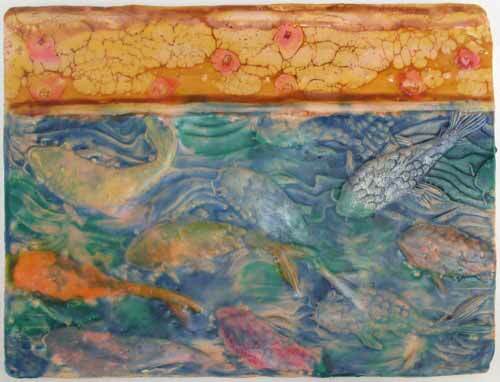 Lynn brought in a ceramic panel that was bisque fired and added transparent wax to enhance the surface. 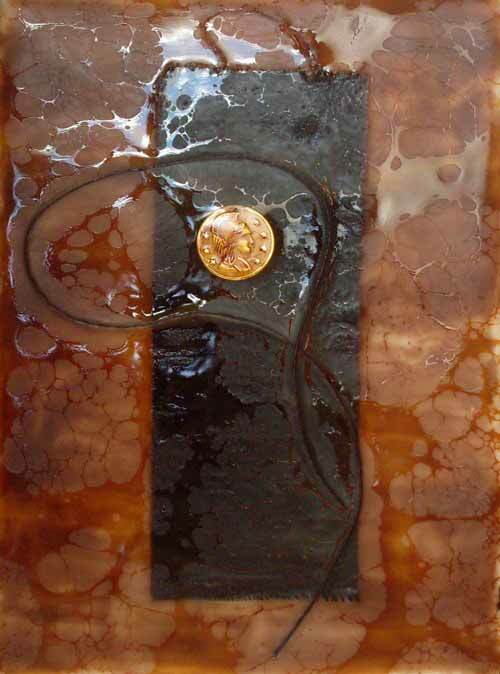 Ruth made this wonderful piece look like leather by combining wax, shellac and fabric. Rodney is vision impaired and contacted me about it before class. I figured out that because I feel the wax as much as I look at it that we should be able to find a way for him to work in the medium. We did! This image uses an image transfer for the figures and the rest was done with a smaller paint brush and his little flashlight to help him see the brush detail as he painted. Nicely done! Dru made this piece with a hand colored photograph glued to the board then covered with clear medium. I showed her how to use wax crayons and PanPastels on top of the wax for delicate surface details. Dru sold this piece to a student from another class during our show at the end of the week. 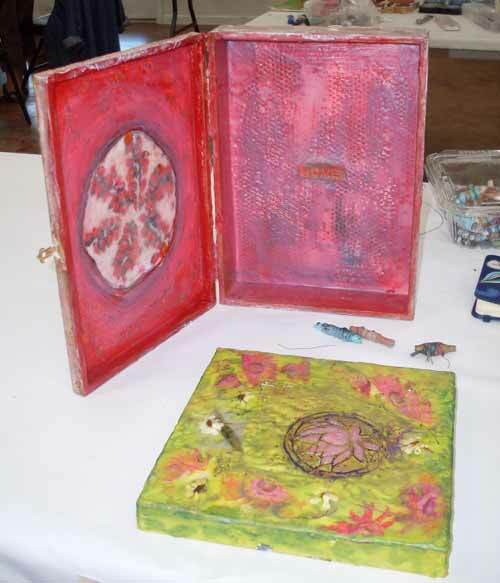 Anne worked with cigar boxes as bases for several of her pieces and come up with some interesting designs, a few of which looked like shrines. We had a critique at the end of class where everyone was able to show off their favorite work in private before it went to the exhibit. During class I mentioned that my dog, Sadie, needs surgery and I was very worried about her. Someone found a photo of her in my collage materials and everyone worked together on this painting of Sadie, wishing her a speedy recovery. It was such a sweet gesture that they made me cry. Thanks everyone! 1. That looks like a hamhock! 2. That girl ‘aint right. Many artists already use the excellent forum hosted by R&F Paints, but now we have a new blog to look forward to in 2009 as well. Below is a great video they posted recently showing how they make paint and pigment sticks, or visit their new blog. 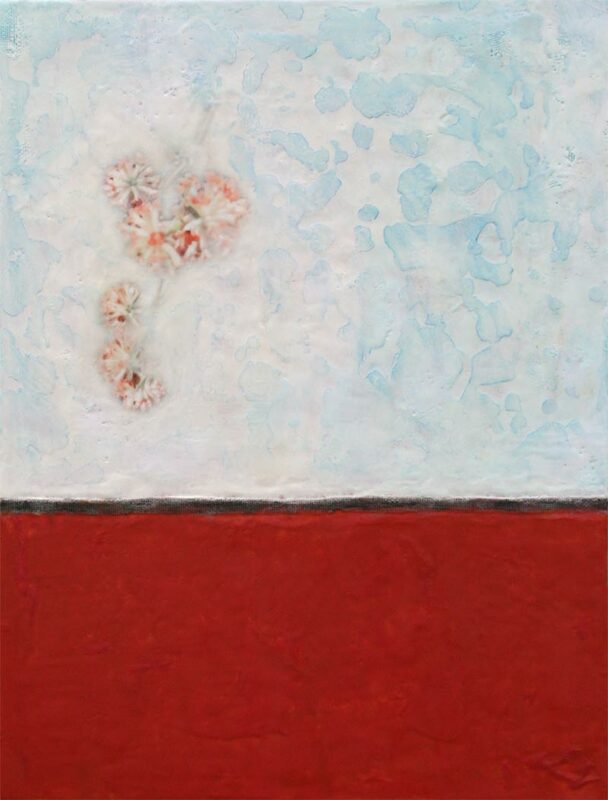 In case you can’t get to Portland to see Andrea Schwartz-Feit’s encaustic show at Butters Gallery (closing Dec. 20), here’s a taste of it through an excellent interview by Eva Lake. It’s always fascinating to me to hear an artist talk about their work and feel the enthusiasm they have for their subjects, but it’s something I rarely get to experience. Here’s a pretty good substitute! 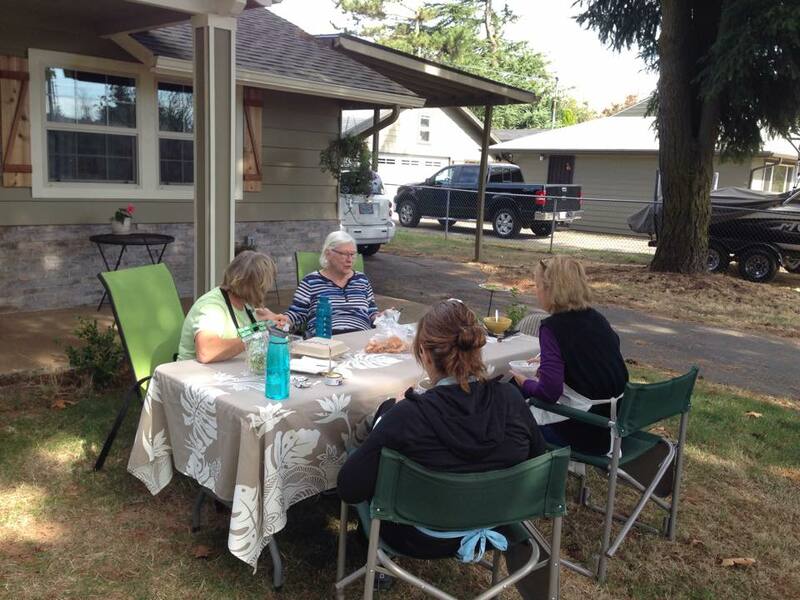 You can find many more interviews on Eva’s blog or on KBOO radio’s Art Focus program Enjoy! Wow, what a busy weekend! 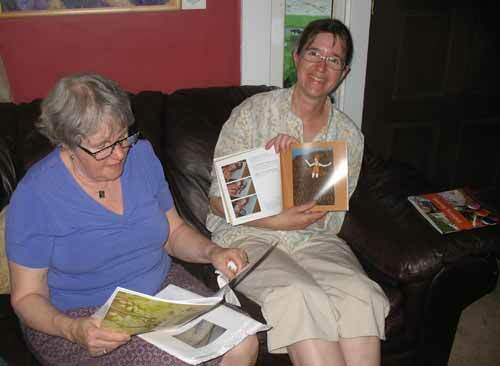 We had a great book release party on Friday for Embracing Encaustic: Learning to Paint with Beeswax and lots of friends came by to wish us well. If you couldn’t make ti to the party here in Portland, here’s a taste of the fun. 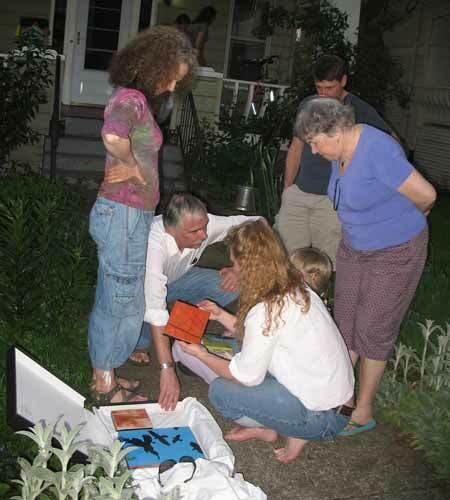 We had our local International Encaustic Artists (IEA) meeting last night as the temperature reached almost 100 degrees. This is unusual for Portland and even stranger because I still have sweat pants in the wash from when I was so cold a couple of weeks ago! We welcomed a new member, Karl, and enjoyed the work he shared with us. Judy Wise and Melinda Fellini gave us the scoop on the recent IEA retreat in Carmel while we tried to cool down with a nice beverage. 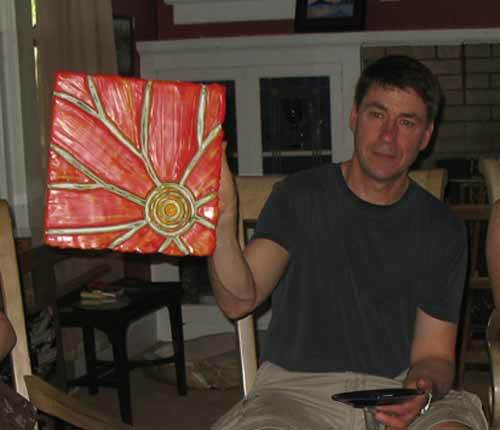 I also shared the first copies of my book, Embracing Encaustic, which arrived the day before. 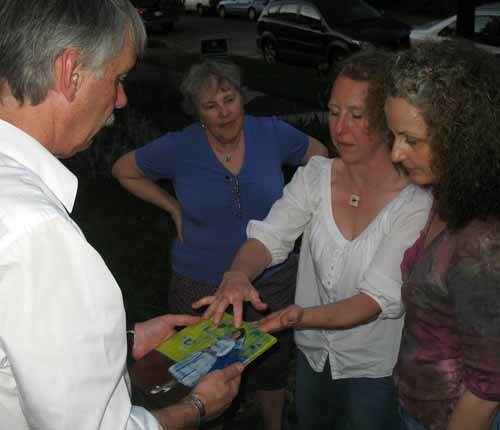 Below is guest artist Andrea Benson reviewing her work in the book. I have a few advance copies, but the bulk of the books have yet to arrive. 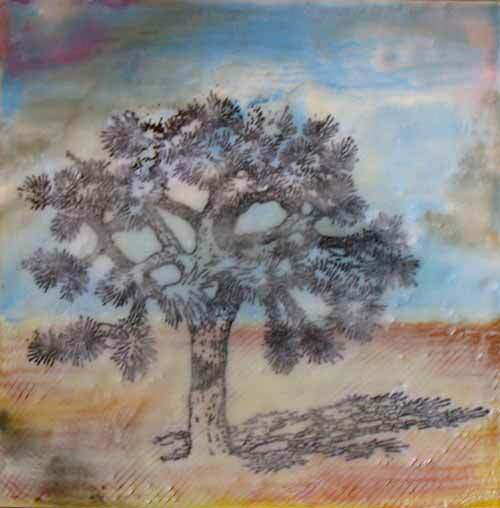 It will officially debut at the National Encaustic Conference in Massachusetts on June 8, and by June 15 it will be available for purchase at www.embracingencaustic.com. 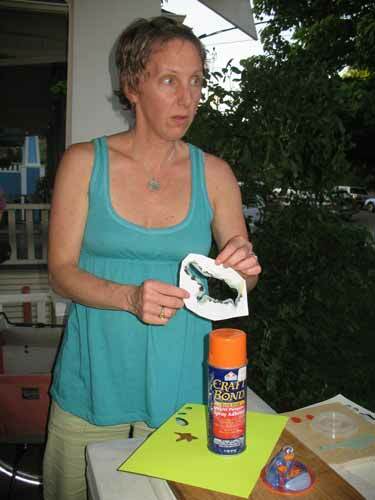 Our demo this month was by Susan Freedman who has a new stencil cutting tool we all wanted to try out. It’s made by Fiskars and makes cutting stencils with paper a snap! We we’re all duly impressed by how easy and accurate it is. I think what she had is an older version of the Ultra Shapexpress. It’s around $20 and from what I saw it will be worth every penny. As many of you already know, I’m participating in The Diptych Project: A Collaboration in Wax, which matched 36 artists into pairs to work collaboratively on 2 encaustic paintings. The objective was for each pair of artists to make two diptychs (a diptych is work made up of two panels). In January I posted an image of my first panel, but now both sets are done! 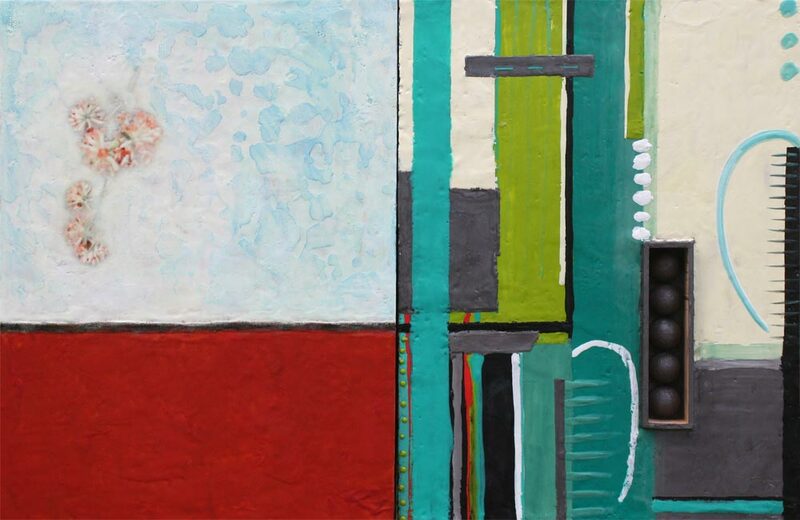 Here’s my panel for the Oregon show, with the full diptych below. My half of the Growing Pains panel, with the complete work below. I was paired with Sara Ameigh and her panel is on the right. Her work is so different from mine that I had a tough time figuring out what to do on my half. I knew my side would have to be simple and calm to balance her side, but I couldn’t decide what to do. After 3 months of consideration my side came together in just three days. (Three very longs day, mind you!) and I’m happy with the result. 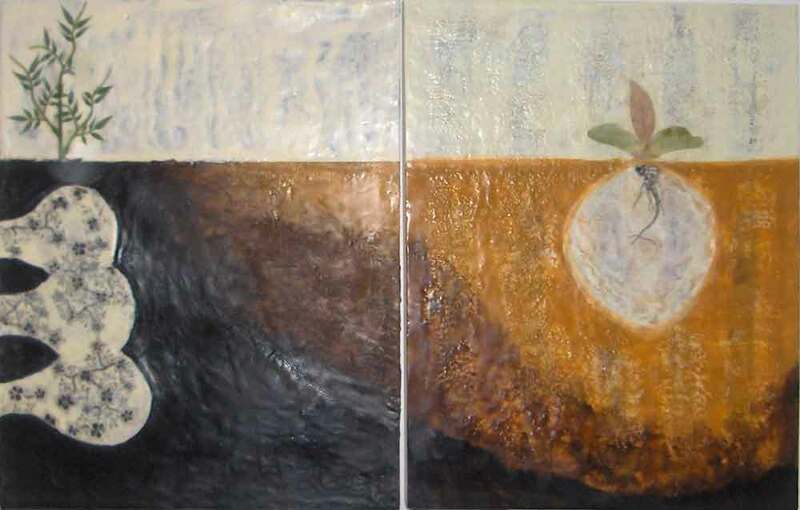 I extended the black line from her panel into mine and echoed the orange color and the round shapes in her work with the image of the flower buds in mine. It is titled Growing Pains because that relates to my botanical image trying to exist within the chaos that surrounds it, but it also reflects the process Sara and I had to go through to make a collaborative work like this. It’s pretty tough to work collaboratively when you can never be in the same room! Our finished work for the Maine show is below. 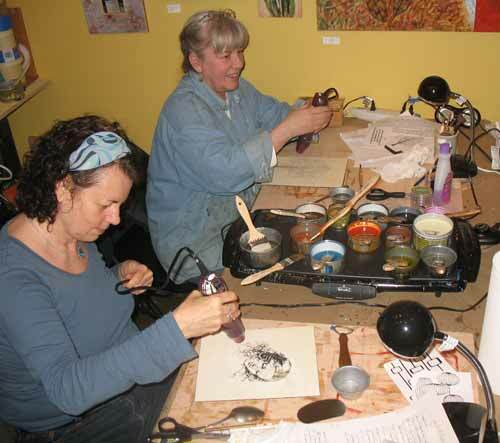 Yesterday I had two classes in a row, both doing Wax Image Transfers. I had initially scheduled only one class, but so many people wanted to try it I eventually added another. Needless to say the enthusiasm was pretty high going into the class, and everyone left with something they loved. That’s not to say there weren’t some frustrating moments. Transfers require some patience and they don’t always work on the first try, which is why I encourage students to bring multiples of all of their images. I have a sad little copy machine available for emergencies but it’s needed more and more encouragement as the days go by just to make one little copy. We’ll see how long it lasts! In any case, everyone left class with at least one success and lots of new knowledge on how to chose an image that will transfer easily. 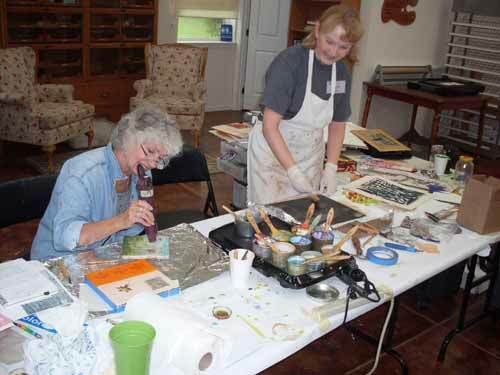 That’s part of what I love about teaching classes in small groups instead of on-on-one, you often learn as much from the challenges your fellow artists face as you do from your own difficulties.